My parents provided me with a very sheltered childhood. I can't say I ever experienced any real pain. When I left home, I headed straight to Northfield, MN for college. A common campus joke is that St. Olaf College exists in a bubble separate from the world. I'm very thankful for the security and protection that my parents gave me during childhood, but I do not want to continue leading a sheltered life. I don't want the bliss that ignorance offers. During our first five months here, when people asked me if I liked Iowa City, I would say, "It's comfortable. I'd like a little more adventure..." Lately, however, I've had Stephen Stills' lines stuck in my head: "And if you can't be with the one you love, honey/ Love the one you're with/ You gotta love the one you're with." I'm not thinking of it in terms of lovers so much as cities; I can't be in a busy metropolis, so I have to love Iowa City. Now, I'm putting down roots. We are going to be here for a long time, and I want to do something good. I have had very little exposure to the homeless population. Here, we encounter them on a daily basis, which, if we are being honest, often leads to embarrassment and misplaced guilt. Owen and I have talked about this extensively, and we agree that we want to make the effort to acknowledge the humanity of homeless people by having conversations with them, rather than throwing spare change at them and running away. Recently, Owen and I have started volunteering at the homeless shelter. Still, this did not prepare us for the conversation we had on our Valentine's night out. Owen and I had dinner at home before dressing up to go out for drinks downtown. We started at a very swanky bar, with expensive house cocktails, and then continued on to something a little more affordable. We ended up at a... underrated establishment that seems to pull in a greater percentage of society's fringe characters than the average Starbucks, also known as a tobacco cafe. Well anyways, we were feeling very 1950s smoking a tiny cigar, with me dressed up in a vintage red dress and Owen in a collared shirt and slacks. Our conversation started to move toward a close at about the same time that the cigar started burning our lips, and we could see the natural end of our night nearing, until my eyes met with those of a homeless looking man outside. He stood at the glass door watching us, which made me think that he couldn't open the door for some reason. So, I went and opened it for him, and he proceeded to sit at our table with us. Owen and I talked about this later and decided that he must have been waiting outside to see if we would invite him in, which I unknowingly did when I opened the door for him. My heart was pounding so hard that I was afraid he might hear it. He looked very rough, and hung his head. After a few seconds, I asked him if he was okay. He looked up at us, and began rolling up his sleeves to show Owen his arms, and I though that he might be showing Owen a suicide attempt. My mind was racing; I did not know who we could contact to help a suicidal man at 11:00 on a Tuesday night. He was actually just showing Owen his tattoos, and he said, "I was a marine." We learned that he had served in Vietnam. He looked up at us very seriously and said, "I did it for you." Now usually these dramatic and clichéd statements annoy me, but that night it didn't; the marks of war and societal rejection shown so obviously in his appearance that I believed the emotions behind the words. We thanked him and he said not to worry about it. At this point I was still on edge. As much as I do not want to be afraid of other humans, I kept thinking, "What if he has a gun? What if he has a knife? What if he is unstable?" Nonetheless I was determined to sit there with him and just listen to what he had to say. He asked us to get him a pen and paper. Again, I had no idea what he was going to come up with. Would he draw some horrific war scene? He told us to watch him closely. At first, it was only squiggles. Every few minutes, he would stop and look up at us and say, "Come on Shaney." 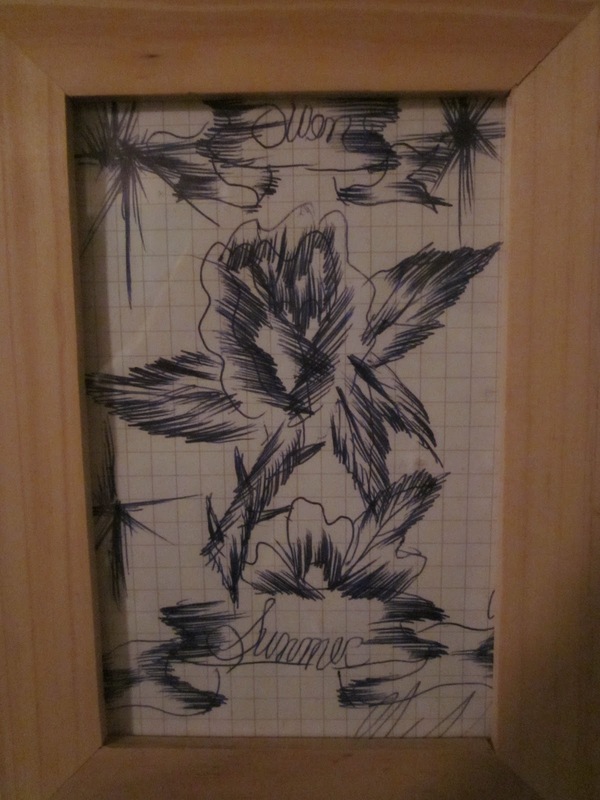 The squiggles became a flower, with banners on the top and bottom. Three times he asked us each our names, and eventually wrote them into the drawing. It looked like a tattoo. During this process, he told us several times to frame it and hang it on our wall. I followed his instructions, and it actually looks really cool hanging on our wall. I don't entirely know what this story has to do with "My Modern Marriage," but I know that I am very thankful that I am with someone else who is willing to sit and wait for an ex-marine down on his luck to express his creative impulse. When he was finished with his drawing we all stood up, we gave him what little cash we had, and shook his hand. He said, "Well, at least I have some talent." Valentine's night 2012 offered us the opportunity to let the bubble pop by allowing Shane to express his art for us. I think back to a "Confucius says..." fortune cookie phrase that I received a few years ago, "Seek not to be appreciated, but to appreciate." Summer, this is a great story. Thank you for sharing it! Very cool. I remember you two told me this story at lunch recently! I'm reading A River Runs Through It right now. (I'm reading it because it's my favorite movie.) One of the lines is, "Help is giving part of yourself to somebody who comes to accept it willingly and needs it badly." Relationships: Jail Sentence or Wings?